Anyone interested in IDA and its mission can become a member -- individuals with dyslexia and their families, educators, school administrators, researchers, physicians, psychologists, and policy makers, to name just a few examples. As a member of The International Dyslexia Association (IDA), you’ll join forces with more than 13,000 others who want individuals with dyslexia to realize their fullest potential. The voice of our members is heard among educators, professionals, and policy makers in the United States and abroad. By joining the IDA, you strengthen the voice of people with dyslexia and enhance their ability to benefit from early intervention and effective teaching methods. Members automatically receive information from National IDA as well as from the So. Cal. Tri-Counties Branch. Our publications provide the latest information about legal and legislative issues, medical and educational research, and technology. Information relates to a variety of learning issues. Member also receive special access on the national web site. When dealing with local school systems, tutors and other resources, it is invaluable to have access to individuals in your community who can help. 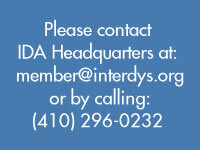 IDA maintains a "referral for services" database, and has 47 branches serving the United States and Canada. IDA was established more than 50 years ago to continue the pioneering work of Dr. Samuel T. Orton, a neurologist who began to identify the biological basis of dyslexia and develop effective teaching approaches. With your membership number, you can access the Members Only section on the national website. There, you can download articles from Perspectives and Annals of Dyslexia, as well as post and research employment opportunities on the Job Board page. Optional special interest groups offer a suite of customized benefits within a community of like-minded professional interests. More information on membership form. Fill out this online Membership Form (see below) and submit it to IDA Headquarters via our secure link OR print the form, fill it out, and fax or mail it to Headquarters (see bottom of form for contact information). Be sure to fax a copy of your ID if you are joining at the Student or Retired level. Institutional (Non-Profit) applicants must fax proof of Non-Profit status. Acknowledgement of payment and a member packet will be mailed within 14 days from submission of application. Membership in IDA covers one year from the month that dues are received. Each member receives up to four reminder notices. Current members may renew their membership online by filling out the Membership Form. Be sure to include the Member ID as it appears in the upper left hand corner of your renewal notice. Acknowledgement of payment will be sent approximately 14 days from submission of renewal application. A "Note" box is provided at the bottom of the form so you can let us know if any of your member information has changed. Please indicate which areas need to be updated so our database will have your most current information. You may designate any donation as “non-restricted” or you may contribute directly to the Dovid Richards Memorial Scholarship Fund, which provides scholarships for training and conferences for local teachers and active parents.